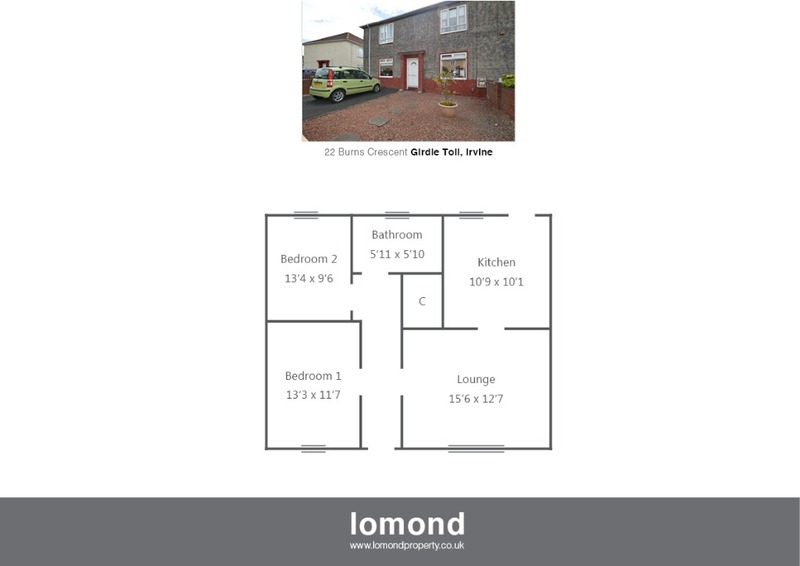 Situated in a popular residential area of Irvine, 22 Girdle Toll is ground floor flat comprising of two double bedrooms, with lounge, bathroom and dining kitchen. Further benefits include, main front and back door, private rear garden and off street parking to the front. In greater detail the property layout extends to an entrance vestibule leading to the main hallway. The front facing lounge is spacious with fireplace and electric fire, all finished to neutral colours. To the rear the dining kitchen comes with floor and wall mounted units, and in turn allows access to the rear garden. Both bedrooms are double in size, ne front facing, one rear. the bathroom is well presented with bath, over shower, WC and WHB. Externally the property has grounds to the front and rear. to the front there is off street parking and a section of garden laid to decorative chips. To the rear the garden is again easily maintained, laid to a combination of patio slabbing and decorative chips. Burns Crescent is a residential area. Irvine town is close by and provides access to a range of amenities including supermarkets, bars, restaurants and town centre shopping. There are a number of local primary and secondary schools within the greater Irvine area.